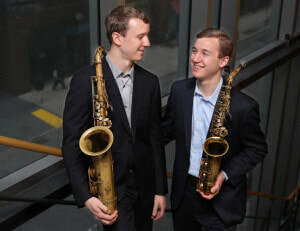 ”Virtuosos on clarinet and saxophone,” (New York Times) Peter and Will Anderson are one of the most extraordinary set of brothers performing music today. Known for their unique renditions of classic jazz songs and innovative original music, they hail from Washington, DC, but moved to New York City to attend Juilliard. Peter and Will have performed with the Lincoln Center Jazz Orchestra, Village Vanguard Orchestra, Jimmy Heath Big Band, Wycliffe Gordon, Cecile McLorin Salvant, Paquito D’Rivera, Kenny Barron, Bob Wilber, Albert “Tootie” Heath, live on Garrison Keillor’s Prairie Home Companion, and are featured on the 2014 Grammy Winning Soundrack of HBO’s Boardwalk Empire with Vince Giordano’s Nighthawks. The Anderson’s have headlined at The Blue Note, Jazz at Lincoln Center, The Kennedy Center, New Orleans Jazz Festival, Sarasota Florida Jazz Festival, South Carolina’s Jazz Corner, Feinstein’s 54 Below, Miami-Dade Cultural Arts Center, DC’s Blues Alley, and Arizona Music Festival. Their ensemble has performed in over 40 U.S. States, toured Japan, and featured four times in NYC’s famed “Highlights in Jazz” series, alongside Lou Donaldson, Ken Peplowski, Steve Turre and Jimmy Cobb. As guest clinicians, Peter and Will have visited over 100 High Schools countrywide in addition to Temple University, Xavier University, University of South Florida, University of Central Oklahoma, Florida State University, Ohio State University, Michigan State University, and University of Scranton. Peter and Will’s debut release from 2012, Correspondence, features Kenny Barron and was listed in Vanity Fair magazine alongside Miles Davis in “Four New Releases to Make You Love Jazz.” The Washington Post called their music, “imaginatively unfolding in ways that consistently bring a fresh perspective to classic jazz.” Their newest album, Deja Vu, features Albert “Tootie” Heath and was called “a burner that reveals the band’s cohesiveness and spirit” by JazzTimes. In 2016, they performed live on Garrison Keillor’s Prairie Home Companion, playing a duo version of “Lotus Blossom” commemorating Billy Strayhorn’s centennial. In 2014, Peter and Will received a Drama Desk Nomination for their Off-Broadway Show, Le Jazz Hot, and in 2018, were Bistro Award Winners.